Jayde is a blue fawn and white girl, out of the famous Cooper and our Blue, who sadly we lost in 2012. She has a star studded pedigree with some super whippets behind her. Like her mum, Jayde is a true to the standard in height. She has great side movement and often placed at the big specialties. 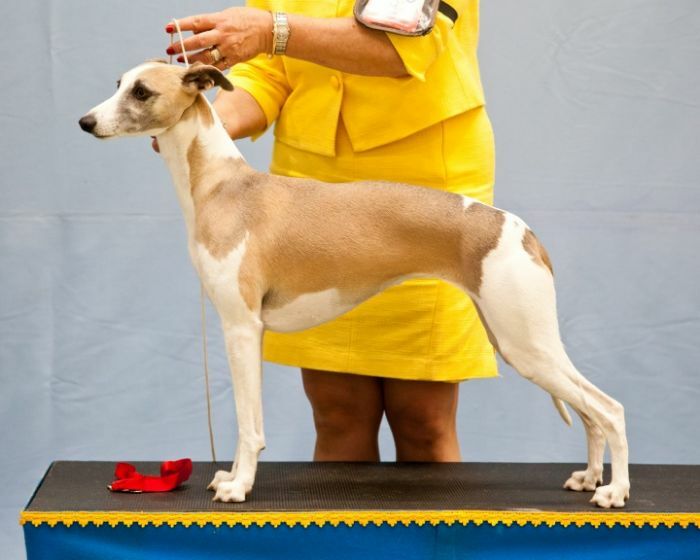 She was 5th in a huge class at the May 2013 National and won her class at the 2012 Sunday Specialty. Never shown much, she is, however, a Multiple Best In Group all breeds winner. Her first litter to Jimmy was born in February 2013 and she had 5 puppies - one of which was promising young deceased Jesse, who was a stunner but deceased early on. We repeated the litter and Jayde had her 2nd and last litter in 2015 from which we kept Sandy (Ch Ridgesetter Summer Loving). We were contacted for an older whippet for someone who had lost their Whippet and so Jayde is now a much loved and spoilt Whippet on the Gold Coast.